Taliban Attacks British Security Company HQ In Kabul, Casualties Reported 5 out of 5 based on 6 ratings. 6 user reviews. At the late hours of November 28, a booby trapped car exploded near the headquarters of the British security company G4S in the Afghan capital of Kabul. Following the explosion, heavy clashes broke out between Afghan security forces and gunmen, according to local sources. Najib Danish, a spokesman for the Ministry of Interior, confirmed to the Reuters news agency that several gunmen stormed the G4S headquarters after the car explosion. Meanwhile, G4S said in an official press release that an “incident” took place at its headquarters in Kabul. “We can confirm that there has been an incident at one of our locations in Kabul. The situation is ongoing and we are coordinating with Afghan authorities to bring it to a conclusion,” G4S said in its press release. An official from the public health ministry told Reuters that at least 10 people were killed and 19 others were wounded in the attack. The official didn’t clarify if any of the casualties were personnel of Afghan security forces or G4S. Later, Taliban claimed responsibility for the attack and said that it was a part of its of its spring offensive, codenamed “Operation al-Khandagh”, which was launched on April 25 in response to Washington’s decision to increase the US military presence in Afghanistan. “The aforesaid military unit [G4S base] located in the center of Kabul city is mainly used to orchestrate operations and attacks in Helmand and Kandahar provinces in the southern part of the country,” the Taliban claimed in an official statement published by its news agency, Voice of Jihad. The attack is another example of the deteriorating security situation in Kabul, which is still witnessing attacks by the Taliban and ISIS on a constant basis. The Afghan government and the NATO seem to be unable toimprove the security situation in the capital. 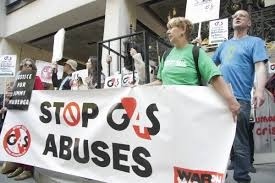 I think G4S is the company responsible for the gas attacks in Syria. G4S has also done work for Israel. And more. That is why Russia dropped a big bomb on thier heads in that bunker they were sharing with MOSSAD and CIA (or G4S or Blackwater or Walmart or whatever cover they were using). That kalibr strike in idlib mountains…late 2016 i think..?? Murder of innocent Western people with families and feelings. G4S? Those are the guys that work as security guards at my mall lol. Didn’t know they had a PMC unit. Private companies are now very commonly used to deploy and support all sorts of hired of guns and even spec ops and spooks. Private company means no Government oversight and no direct link back to Government either, giving options to deny etc. Great cover for spec ops and spooks. Private is the way to go these days – no public accountability whatsover. Why on earth would a kid want to work in a prison ? Money for nothing and your tricks for free. Ah, the plot thickens – At least one UK private ‘contractor’ / ‘advisor’ / ‘trainer’ / ‘merc’ call them what you will (but really a spook or spec ops guy using a cover lie) was reported as being on board that spy boat in Kerch. By the way, why is the spy boat still being called a ‘tug’ when even the Ukrainians have admitted it was crewed by intellegence officers? The ‘spy tug’ crew have been in for questioning for some time now. What if something was revealed that led back to the pack of spooks / spec ops posing as G4S in Afghanistan. What if they were taken out as a message to the UK (like the ones in the Bunker in Syria that a rather big bomb dropped on it, after they coordinated an attack on Russians?). Lots and lots of what ifs, and conspiracy theory fodder galore! Gut feeling tells me the UK spooks or special ops on the tug had something to do with the UK spooks or special ops if Afghanistan being taken out. A message was sent. Also, my gut tells me that MANPADs (very, very, conspicuously absent) will soon appear in Afghanistan if the US ‘trained’ Intel officer paraded on TV actually turns out to be a US spook too. Russia and Iran have clearly both held back the MANPADs (and the people who can use them properly) turning up in Afghanistan. MANPADS and other light missiles will greatly level the playing field and force the UK and US to think about strategies pretty quick. The attacks on suply routes in Pakistan may happen again too. I am sure not just Russia but Iran have a few other ‘suprises’ (some very conspicuously absent too) for the UK and US in that region. I dont like the idea of throwing manpads around…it could bite you back quick…all it takes is one traitor. A rat gave a scorpion a ride across the river…before they crossed the rat made sure scorpion would not sting him. Halfway across the river, the scorpion sting the rat, as they were sinking…the rat ask” why did you sting me now were both dead”. Scorpion says: im a scorpion…i sting. Let’s call a spade a F#-ing shovel, why don’t we. Strangely enough, wherever they go, all hell breaks loose. PS to me – “Today the words are used interchangeably except by specialists, but the spade is for digging, the shovel is for scooping. This difference manifests itself as an angle in between the handle and blade of a shovel while the spade is more or less straight from handle to blade”. ” NATO are yet to take any serious measures to improve the situation in the capital.”(c)? Cmon now! There were very serious measres to increase and intensify heroin traffic out of Afganistan. Pay credit where it’s due. G4S is there to secure the lucrative poppy fields in Helmann and Kandahar. Taleban who banned opium in year 2000 dont like to be innocent blamed for Nato´s drug trade.